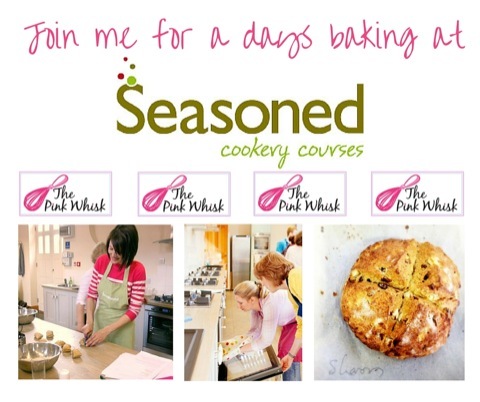 On the first day of Christmas The Pink Whisk sent to me (singing please! 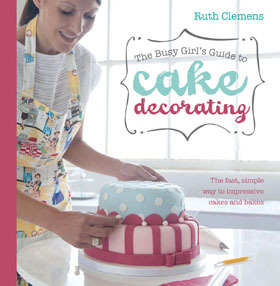 )…..Ideas for Decorating your Christmas Cake. Here are last years recipes to peruse for a taste of things to come. So Day 1…. 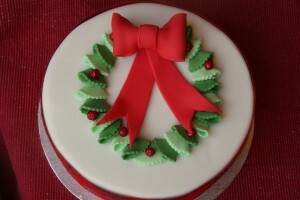 ideas for decorating your Christmas cake. Hopefully your cake is maturing just nicely, its time to get it decorated so you can get on with doing other things in December, like your present wrapping and Christmas do’s! Unwrap your cake from the paper and foil you’ve been storing it in and set it on your worksurface. See whether it is level, mine isn’t so it needs to be levelled with a knife – any excuse, it means I get to eat the trimmings! Using a large serrated knife cut the dome of the top of the cake if necessary. Prepare your cake board and position your cake on it so that the cut side is downwards and the base is now the top. Check that you’re happy with your levelling and adjust if necessary. A small sausage of marzipan just under the cake can help to level if you don’t want to attack it with a knife. Take your jam or marmalade and zap it in the microwave for 30 seconds to soften. Using a pastry brush paint the outside of the cake with a thin layer of jam (avoiding any bits!). So now the cake is nice and sticky and will be ready to glue on the marzipan layer. 500g is enough marzipan to coat an 8″ cake. If you love the taste of marzipan you can make this layer thicker but you will need more to do so. Knead gently on your worksurface to ‘warm’ the marzipan which will make it easier to work with. Take half of the marzipan and shape into a rough sausage shape. Dust your worksurface with icing sugar and roll out the sausage into a long strip to reach around the outside of the cake. Measure with string to help you know how long it needs to be. It’s always longer than you think! Again, with the string, measure how tall your collar of marzipan needs to be and cut to the right height. It should be 5mm above the top of the cake. Easiest for cutting marzipan and sugarpaste is a pizza cutter, the type that rolls. Position around the outside of the cake and trim neatly where the two edges meet. Gather together the trimmings and the remaining half of marzipan and roll out to about 5mm thick on your worksurface. Using the tin you baked the cake in as a template cut out a circle for the top of the cake. Place the circle on the top of the cake, gently sealing together the edges where it meets the marzipan collar. Use your hands to smooth the seams of the marzipan. Smooth the top and the sides working out any major lumps and bumps. Now you need to leave it to one side to dry a little – 24 to 48 hours. Now I know you Pink Whiskers don’t like waiting and like to get things done here and now (far too impatient like me!) but it is important in getting a really good finish on the sugarpaste layer. The marzipan needs to be slightly firmer to give you a fighting chance. So put it to one side and come back to it tomorrow. Okay, so the marzipan has set a little and we’re ready with the sugarpaste. Work with 1kg of sugarpaste for an 8″ cake. The thicker the sugarpaste the easier it is to work with and the less it will crack and split on you. My preference is for Dr Oetker, ready to roll icing as others tend to be too sticky and you’ll end up frustrated working with it! Dust the worksurface with icing sugar. It looks like I’ve been a bit too liberal with it here so please hold back, do as I say not as I do! As soon as it’s out of the packet sugarpaste will begin to dry out which is the cause of cracks when it’s applied to the cake, too much icing sugar on the surface speeds up the drying out process so you do need to be careful. Knead the sugarpaste to warm it up making it much more pliable. Measure across the cake with a piece of string from the board, over the top and back onto the board again and cut the string to the right size. Dampen the marzipan with a pastry brush dipped in a little bit of water or a clear alcohol such as vodka or gin. Begin to roll out the sugarpaste making sure it’s not sticking, once it sticks it’s gameover and you have to start again. You can turn the sugarpaste when rolling but don’t flip it over. Measuring with your piece of string keep rolling out, into a rough circle until the sugarpaste is just over the right size. Polish the top of the sugarpaste with the flat of your hand to smooth it out. Take any rings or watches off first as they always catch and rip up your hard work. You will feel what I mean as you polish – the sugarpaste takes on a shine and will be super smooth. Place the rolling pin in the middle of the rolled out icing and flip it over. Use the rolling pin to lift into position on the cake. Flip over the sugar paste and remove the rolling pin. Starting on the top, ignore the sides for now, polish the top of the cake with the flat of your hand again. When you are happy with the top start working the way down the cake with your hands, smoothing the sugarpaste into position. Go slowly and work from the top of the cake down towards the board. If the sugarpaste starts to crease lift it away from the cake and smooth from the top down again. If the sugarpaste begins to crack you can ‘polish’ out the start of any cracks with the palm of your hand or your fingertips, working over the cracks in a circular massaging motion. Eventually you will have worked all the way down to the board. With a sharp knife trim off the excess sugarpaste at the base of the cake. Wrap up the excess in clingfilm and save it for now. Set your cake to one side and leave overnight to firm up. Again this is important before we start adding the decoration as the sugarpaste is soft it is really easy to nick and mark it with your hands and we don’t want that do we? 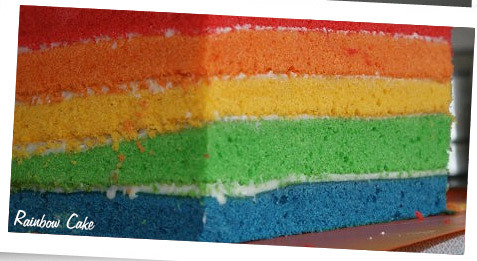 So here’s some ideas for decorating your cake (including last years designs). Click on the links for the full tutorials. This entry was posted in Christmas, Decorating, Sugarpaste, Treats, Twelve Days of Christmas. Bookmark the permalink. Ruth. I can’t wait to start making my christmas cake. Thank you so much for some fantastic ideas! They look wonderful. I love this blue cake Ruth, it’s got a real Wedgewood look about it! I’ve ‘starred’ this so can refer to it again! Some great tips there. Never thought of using the cake tin to cut out the marzipan doh! 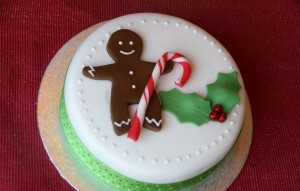 Love the Gingerbread Man cake, that’s my theme this year so will have to find some chocolate fondant. Thanks. Ruth the cakes look amazing! 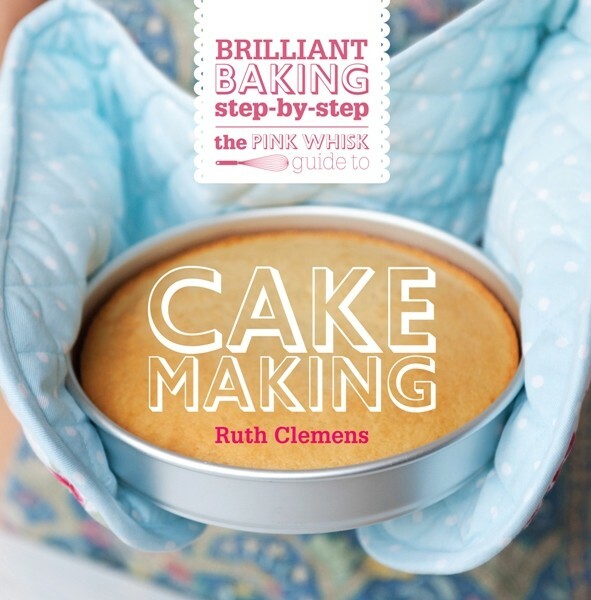 I’ve done two boozy fruits and so two cakes – just bought the equipment for the blue cake and the snowflake cake. I’ve been feeding my cakes brandy and Christmas tea but just sliced off the top and they are very very wet, almost puddingy. I’ve blotted them with kitchen roll and will leave them uncovered for a couple of days before marzipanning them – any suggestions? Great idea Ruth, popped them in the oven for half an hour at about 110C, then switched the oven out and let them sit for a couple of hours cooling off. Not only did they dry out a but, but my house smelled gorgeous and christmassy! I’ve marzipanned and flat iced them and will decorate early next week. Those are so beautiful! What a nice change from the usual. Kate from the 5 F’s blog sent me over and I will put you on my Christmas Bloggers post and give you a tweet in the next couple of days if that’s ok with you? 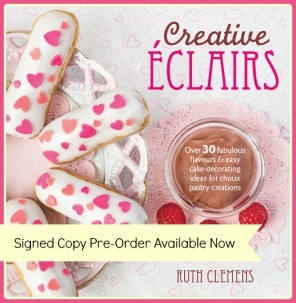 Thank you for your recipes and tips Ruth, they’re fab! First time baking chrismas cake and fed them like suggested, but the top feels a little squidgy and not like other sponges such as victoria sponges. When I tried to level the top it did not cut well and came off in clumps. The Sides feel firmer. Is this the correct feel or should I do the same as Kay. Thank you for such a big and encouraging reply, popped them in the oven for 10 minutes at 60 degrees and it seems to have helped it get ready for the marzipan stage. Just to add that when I insert a skewer, it comes out clean. Before my ‘too moist’ worries, I had brushed the cake one more time and had coated the sides in apricot jam so dont know if thats confusing my judgement…. 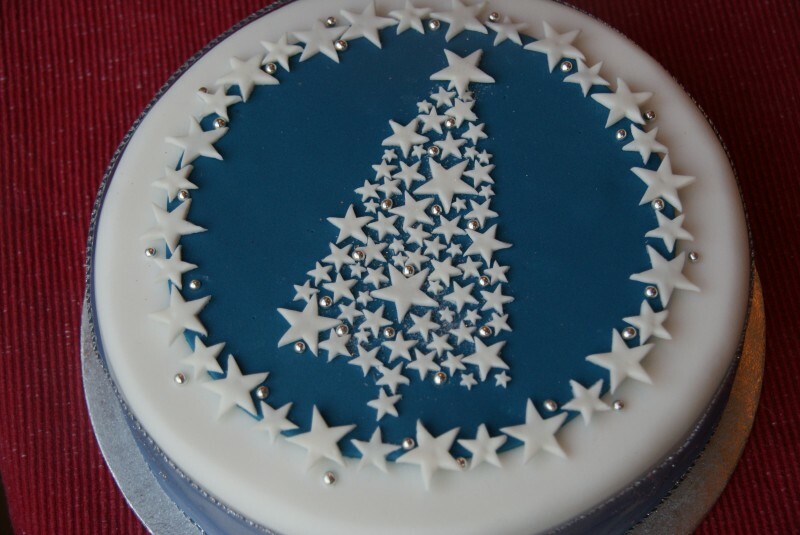 Thank you for any advice, Im feeling the pressure of making other people’s christmas cakes! I was patiently waiting to make and feed this delicious cake all year. Now the time has finally come to ice it. I unwrapped it today a few weeks after the final feeding and I can’t describe how amazing the smell was, what a wonderful cake Ruth. Thanks for this fantastic recipe. HERE is my version of your Gingerbread Man cake, thanks for the inspiration. Oh I love this – it’s so classy and beautiful! Maybe next year! Hi I have made my xmas cake and used a lower oven than usual as they cooked too quickly last year.But seemed a lot of melted butter on the baking tray and the top of the cakes has crunchy type sugary on top as if the sugar has come up to the top. Will it be ok inside? doh! I am just so much in love with your works…they are awesome! Lovely decorations Ruth, so simple, yet so effective. Thank you. Is sugar paste the same as rolled fondant? 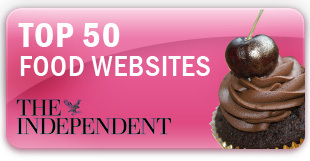 Your cakes look fantastic! 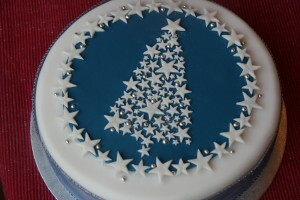 Can you advise me how far ahead of Christmas I should ice and decorate my cake?